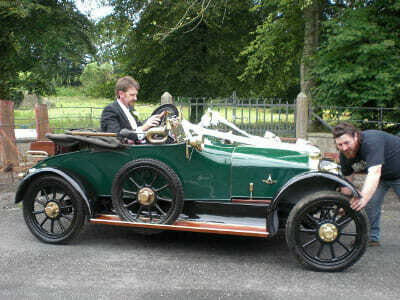 The Enfield light car for 1915, Four-cylinder 10 h.p. Engine. 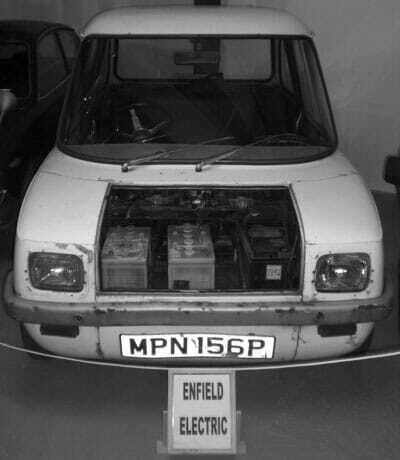 When a car has proved systematically good throughout there is obviously no reason to alter the design for the mere sake of altering, and such is the policy adopted by the manufacturers of the Enfield light car for next season. Side view of the 1915 Enfield light car. Note the graceful curves of the streamlined body. With the exception of one or two minor improvements, then, the new model remains practically unaltered. The alterations take the form of practical improvements which should tend to make the Enfield an exceedingly attractive proposition. Doubtless what will appeal to the prospective buyer most is the inclusion of an electric-lighting outfit, which includes two powerful headlamps, side lamps, and tail light. The dynamo, which is carried between the chassis and gearbox, being bolted up to the latter by a special plate, which is screwed on to the gearbox bearer arms where they clamp the sub-frame, is driven by a Whittle belt from a pulley off the propeller shaft. Detail Improvements in Body and Chassis Render this Machine an Excellent Proposition. 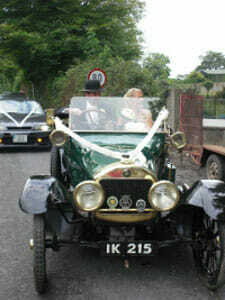 Front view of the 1915 Enfield light car. The manner in which the dynamo is carried strikes us as being particularly good, as it is out of the way and does not come into contact with other parts of the mechanism, while it is most accessible. The next improvement is doubtless the increased body room. The seating space is considerably enlarged and will hold two persons with ample reserve. For this next season, leather upholstery is specified as standard. Another feature is the introduction of steel artillery wheels, but these are optional, and wire wheels, as fitted last year, can be had if desired, either kind being detachable. Mudguarding has been improved by a much wider pattern of guard being fitted, and we also noticed that metal valences now entirely surround the body. A little innovation which should prove most acceptable to the driver is seen on the floorboard below the control pedals. Hereabouts a well is made, just to fit the heels of the boots, so that not only is the angle of the foot set correctly for the pedals, but a support is formed for the foot when applying pressure. We noticed that the radiator had been somewhat altered, and this turned out to be a general rounding off of the corners, certainly enhancing the appearance. The car is sent out equipped with hood and screen, lighting set, horn, kit of tools, etc., and spare wheel, and sells for £175. The makers are the Enfield Light Car Co., Fallows Road, Sparkbrook, Birmingham.